We are so excited to to announce that the Ithaca Tompkins Regional Airport (ITH) is the winner of the Chamber Awards! 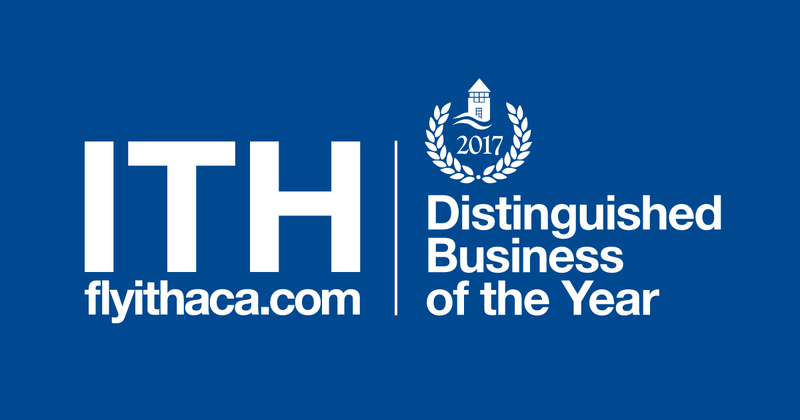 ITH won the Distinguished Business of the Year, one category out of four that recognize our community’s business efforts and success. The award was presented in the Chamber’s Annual Dinner, held last Thursday, January 25th at Ithaca College Emerson Suites. Although it is not often that municipalities get this award, ITH was honored with it for their strategic management of a critical transportation asset for the region. And as you know, there were many positive outcomes in 2017 that contributed to the airport’s success. This year, all three airlines at ITH are fully serviced by jets – this is a great asset to the community as it offers better service options to the traveling public. The airport operations staff passed the Federal Aviation Administration (FAA) Annual Inspection with zero safety discrepancies, because of their excellent maintenance standard of the airfield. ITH also earned grant assistant from the FAA and with help from their engineering consultants, C&S Companies of Syracuse, New York , it will continue to improve its infrastructure and image to reflect the Ithaca community. Under the exceptional leadership of Roxan Noble and Josh Nalley, ITH worked long hours to ensure that it offered a reliable, remarkable service. As a result, ITH only closed for one hour in all of 2017 due to winter weather. It was also notable that Noble and Nalley’s organization of the The Annual Airport Day/Runway 5K was also a success and raised over $2,750 for the Tompkins County SPCA, showing the impact ITH has for its community. ITH has also received grants from New York State Department of Transportation (NYSDOT) for a new flight academy, which will assist with the nationwide pilot shortage and create more jobs for the region.